The ICAS Ethics Board has published the guidance paper to help CAs make the ‘journey’ from identifying an ethical dilemma to its resolution. The aim is to highlight that there are a variety of ethical perspectives which might be useful when facing an issue. It is intended that a CA would use the term ‘the right, the good and the virtuous’ as a rule of thumb to help in finding a solution to an ethical dilemma. As part of ICAS’ ‘The Power of One’ business ethics initiative, the ICAS Ethics Board has published the guidance paper, “The Ethical Journey – The Right, the Good and the Virtuous”, to help ICAS members make the ‘journey’ from identifying an ethical dilemma to its resolution. The aim is to draw attention to the fact that there are different ways of looking at ethical dilemmas, and how people make decisions – that there are a variety of ethical perspectives which might be useful when thinking about an issue. It works in tandem with the principles in the ICAS Code of Ethics to assist CAs navigate through and resolve ethical dilemmas. There are many theories, or “schools”, of ethical thought however, for practical purposes, the three schools that have traditionally been viewed as the primary lines of ethical thinking have been used. 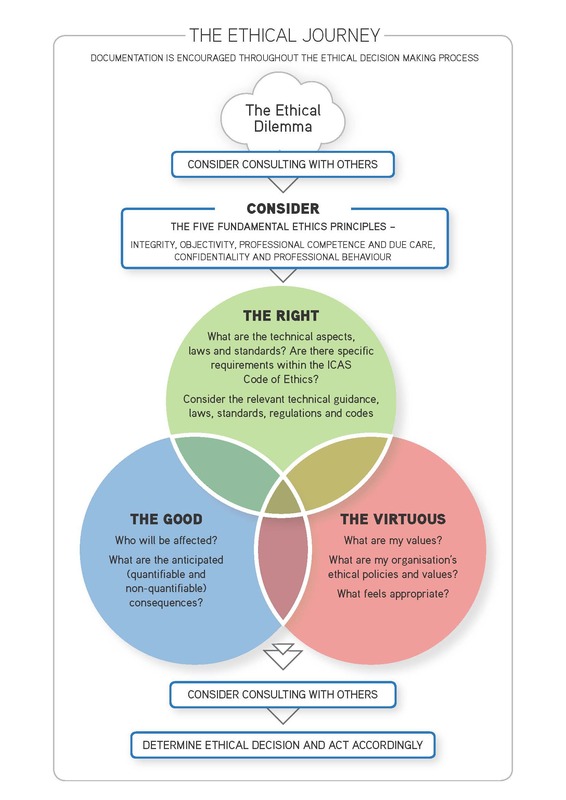 These three schools, identified as “the right, the good and the virtuous”, serve to highlight that when faced with an ethical dilemma, there are a range of factors that people can consider in order to aid with the resolution of an ethical issue. The Right: What are the technical aspects, laws and standards? Are there specific requirements in the ICAS Code of Ethics? “The Right” focuses on laws, duties, rights and obligations. In the first instance, a CA must consider the technical aspects of any given situation – the applicable laws, codes, regulations and standards. If a CA is of the opinion that a proposed course of action is illegal then that action cannot be taken. Similarly, a member of ICAS must also observe any requirements within the ICAS Code of Ethics (highlighted in the Code by the word “shall”), and adhere to the five fundamental ethics principles. The Good: Who will be affected? What are the anticipated (quantifiable and non-quantifiable) consequences? “The Good” focuses attention on the consideration of the consequences of an action. It guides the CA to objectively reflect upon the anticipated consequences of one’s actions; to consider who might be affected by the decision; to make value assessments between good and harm, cost and benefit. For example, if the CA faces a situation where two projects appear to be equally sound but one has more beneficial consequences, for example involving fewer redundancies or being more environmentally friendly, then a consideration of consequences could help to inform the decision. The Virtuous: What are my values? What are my organisation’s ethical policies and values? What feels appropriate? “The Virtuous” focuses on “values” and “virtues”, and directs attention to consideration of the most appropriate action to take. Values that could be classified as “virtues” that are commonly identified with accounting include integrity, objectivity, honesty, reliability, independence and trustworthiness. Similar values may also be reflected in the ethical policies of the organisation for which the CA works. Something may be within the law, the potential “good” may outweigh the “harm”, but that does not necessarily mean that a particular course of action is the most appropriate if it does not marry with the individual’s, or their organisation’s, values or reputational risk appetite. Each individual “school” provides a useful perspective for making ethical decisions. However, all also have their limitations. The three “schools” may not always point to a common answer as to what is the most appropriate ethical action to take in a given circumstance but, nevertheless, each provides a perspective to be taken into account in reaching a judgement. A CA must follow the law and the ICAS Code of Ethics, however, many ethical dilemmas are not directly addressed by either of these. The “three pronged” approach highlights that all three “schools” therefore need to be considered together to find a solution to an ethical dilemma that is, on balance, the most appropriate/justifiable, taking all circumstances and considerations into account. Once a judgement has been made as to the ethical course of action, often the difficulty then lies in carrying out that action. It is recognised that members will often need to have resolve, and moral courage, to ensure that the most appropriate judgements are arrived at, and that the most appropriate actions follow. Sometimes it can help to speak with others regarding a situation rather than facing a problem in isolation. 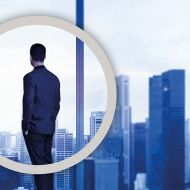 Members are therefore encouraged to seek the views and support of others if they feel the need arises – be that a line manager, a partner in one’s firm, other directors on the Board, another CA in the organisation, another CA elsewhere, or indeed ICAS itself. Documentation throughout the ethical decision-making process is also encouraged so that there is a record of the issue and the matters taken into consideration in reaching the judgement and action. ICAS has published an ‘Ethical decision-making framework’; case studies; and a series of papers on ethical leadership as part of ‘The Power of One’ campaign, which can be used as a point of reference. 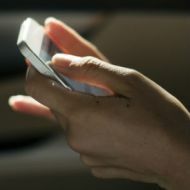 ICAS also offers an Ethics Helpline Service to provide guidance to members as required. Search for ‘Ethics and The Power of One’ on icas.com to find out more. Members with an ethical query can contact us using the following methods.